We all know a golden rule: if you want to do something, you should know the rules how to do that. In this passage we are going to go through the main rules of online roulette, including betting. There are different types of bets: inside and outside. Inside bets are those, which include the numbers, outside bets are those, which include sets of numbers, color, even or odd numbers. Before even gambling you should learn what the roulette bet is. You should always remember that the house always wins, even if you win. One of the preferences you should also follow is to play a single zero roulette. Why? Because the house edge is twice as less as in the double one. 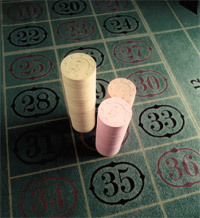 Also some players advise to develop own system of betting, so that you will increase your chances in the roulette game. You should not neglect the bets on several numbers either. Straight bet is good, because the payoff is 35 to 1, but it is one chance among 37 or 38 possibilities that it will come up. If you make a split, street or five-number bet, you reasonably increase your chances to win, although the winnings decrease. In this case, you need to choose, which strategy will lead you to success. Also you can take advantage of the outside bets by betting on red, black, even or odd number. The average table can seat up to six gamblers. You should stop wagering, when the dealer says "No more bets." Because all the bets made after this phrase, are called cheating. The type of cheating after the allowed time is called pastposting. If you are winning, you should tip the dealer. It turns him on your side, and he is nicer to you. The dealer only represents the casino, which makes a lot of money, but the dealer earns as every other blue collar worker. The casino gives them less salary, as they know that the dealers would be tipped.